In a 2-quart microwave-safe bowl, microwave the sweetened condensed milk and chocolate chips on high for 1 minute. Let sit for 1 minute and stir. If chips are not all melted, microwave another 30 seconds. Add vanilla and pour into a buttered 8-inch square pan, lined with aluminium foil. In a separate bowl, microwave the dulce de leche just until pourable: 0 - 20 seconds. 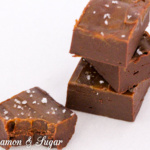 Pour over chocolate fudge. Use a cold butter knife to swirl the caramel. Sprinkle with sea salt. Cool completely. Cut into 1-inch squares and enjoy! Be aware that a package of dark chocolate chips may not contain 2 cups. Measure before starting the recipe. Next time I make this, I will add some toasted pecans to the top since it's reminiscent of turtle candies!